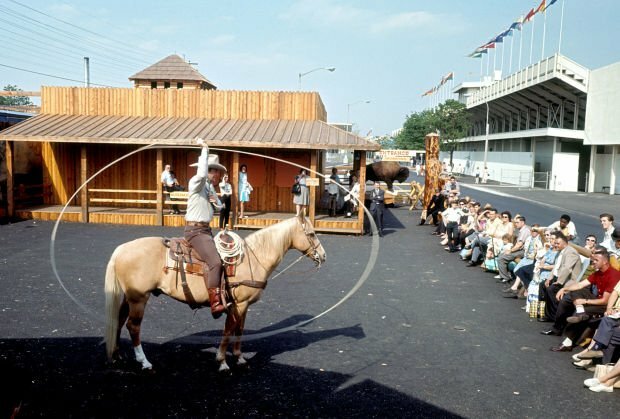 Trick roper and cowboy singer Montie Montana Jr. and his palomino Buckshot were hits wherever they performed with the Montana Centennial Train in 1964, here outside the Montana Pavilion at the New York World’s Fair or in the upstairs of an elaborate ballroom in Washington, D.C. 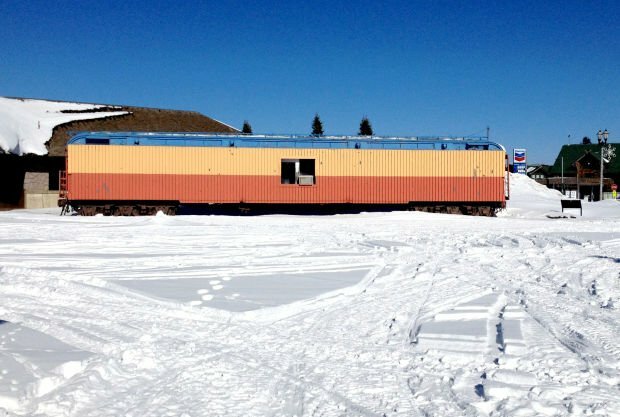 Though fading and empty now, a Montana Centennial Train exhibit car still lends a colorful splash to the winter landscape outside the Yellowstone Historic Center in West Yellowstone. Curator Fran Rogers said money is in hand to spruce up the exterior of the Centennial Train car that is now the centerpiece of Alberton’s Railroad Museum. The gaps between sets of brands show where massive murals were once mounted for the train’s trip to the New York World’s Fair in 1964. Several of Rice’s paintings are in storage, but six are on display in the Centennial Train Room at the Yellowstone Historic Center and Museum in West Yellowstone, including paintings depicting vigilantes and mountain men. Ranchers from across Montana paid $15 to have their livestock brands riveted to the Montana Centennial Train cars, including the one that now houses part of the Alberton Railroad Museum. Though an introductory panel misidentified C.M. Russell’s “When Shadows Hint Death,” a collection of pieces by Russell and Frederic Remington was a popular feature on the centennial train in 1964. The artwork was conservatively appraised at $60,000. The Montana Centennial Train brought a taste of the Old West to 16 U.S. cities as it made its way to and from the New York World’s Fair in April 1964.